Here are 6 of his popular accessory pieces, see below. Be sure to visit his Clockworks; an option on the previous page. An elliptical top with decorative pierced arched legs. Modeled after a larger Limbert Library Table. 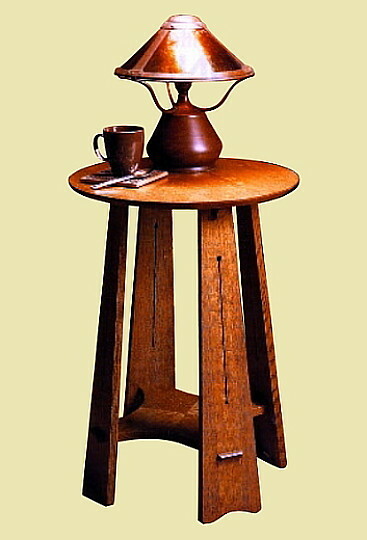 This scaled-down version preserves the original overall proportions, as well as elliptical top and shelf, gently curved legs, and decorative piercings in the stretchers. Bridle joints hold the legs and aprons together, and a notched bridle joint is used where the stretchers intersect. The legs and shelf are notched where they meet, and slip tenons join the stretchers to the legs. Oval top is approx 3′ x 2′, table top is 20″ in height. Available in quarter-sawn white oak finished in a medium Limbert brown stain with a satin polyurethane and waxed finish. Also available in natural Cherry which is not stained but finished with satin polyurethane and it will darken with age. This Limbert table from the early 1900s features gentle curves on each edge and arched openings in the side panels provide access to the shelf. Overall dimensions: 20″ wide, 20″ deep, by 29″ high, crafted of quarter-sawn white oak finished in a medium Limbert brown stain with a satin polyurethane and waxed finish. Also available in natural Cherry which is not stained but finished with satin polyurethane and it will darken with age. 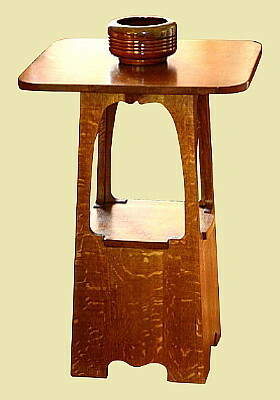 This is the so-called �lost� Stickley Mission style table, which was prototyped, but never was in production probably due to the difficulty of controlling the splayed legs which makes the table unique. It�s this slight angle that gives this table more character than straight-legged versions that were mass produced. 27″ high, 22″ deep, 16″ wide crafted of quarter-sawn white oak finished in a medium Stickley Aurora brown stain with a satin polyurethane and waxed finish. Also available in natural Cherry which is not stained but finished with satin polyurethane and it will darken with age. Take a look at this table, and I know you�ll find something to admire � whether it�s the highly figured quartersawn white oak, the decorative slots in the tapered legs, or the dramatic grain patterns of the round tabletop and the cross-shaped shelf. Approx. 30″ tall, the top is 22″ round crafted of of quarter-sawn white oak finished in a medium Stickley Aurora brown stain with a satin polyurethane and waxed finish. Also available in natural Cherry which is not stained but finished with satin polyurethane and it will darken with age. 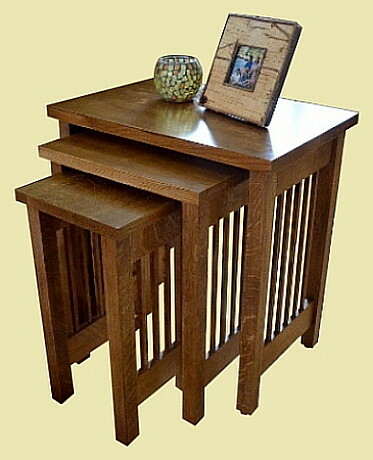 A 24" tall version of this table is also available. 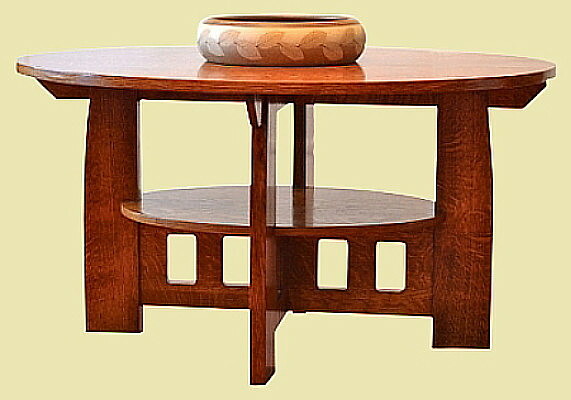 A practical set of 3 mission style tables with all table tops a solid 1″ thick. 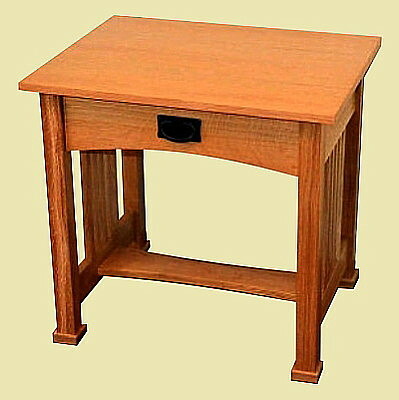 Small table is 1′ 8″ tall; top measures 10″ x 11″. Crafted of of quarter-sawn white oak finished in a medium Stickley Aurora brown stain with a satin polyurethane and waxed finish. Also available in natural Cherry which is not stained but finished with satin polyurethane and it will darken with age. 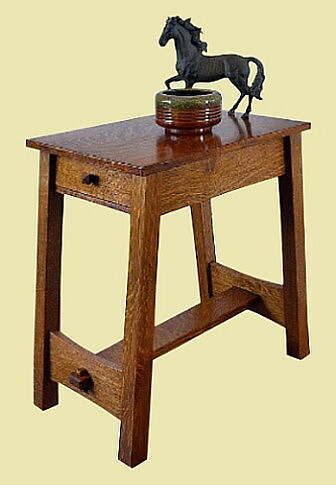 The prefect side table for the living, family or bed room. 24" tall with a top 25 1/2" wide and 13" deep crafted of of quarter-sawn white oak finished in a medium Stickley Aurora brown stain with a satin polyurethane and waxed finish. Also available in natural Cherry which is not stained but finished with satin polyurethane and it will darken with age. NOTE: Patrick crafts accessory furniture to the order and a 25% deposit is required. Please allow 3 weeks for delivery.